During that concert you will hear pieces by great composers, such as O. di Lasso, J. S. Bach, J. Haydn, P. Czajkowski, C. Debussy, M. Ravel in interesting transcriptions for a trombone quartet. 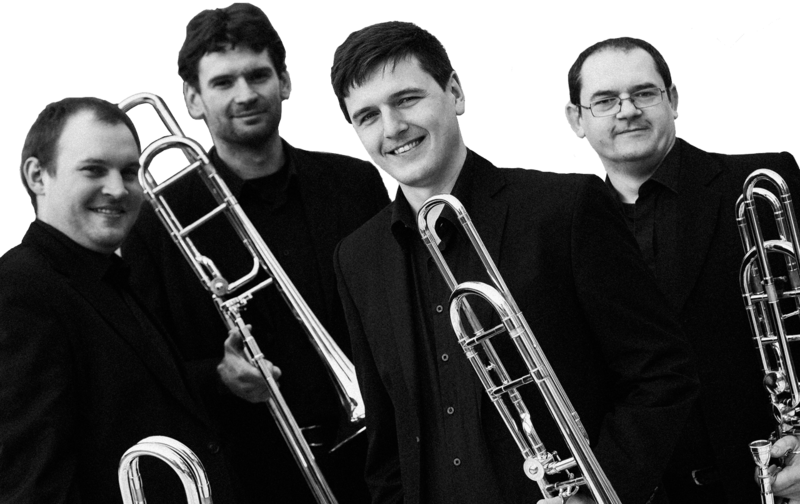 Moreover, the concert's program includes compositions specifically prepared for a trombone quartet by contemporary artists, both Polish and international. `We would like to invite you for a musical journey across time. The concert's program includes compositions by great masters of baroque, classicism and romanticism, as well as jazz standards, such as Take Five, St. Thomas, All the things you are and many others! What do well-known pieces and jazz standards sound like when they are re-worked for a trombone quartet? Find out for yourselves by listening to compositions by such artists as: George Gershwin, Henry Mancini, Sonny Rollins, Paul Desmond, and even Johannes Brahms. Together with the TrombQuartet band you can experience a journey to the world of the past. On your way, you will listen to the most beautiful works of the masters of early music, such as Michael Praetorius, Orlando di Lasso, Giovanni Battista Pergolesi, as well as one of the most prominent composer of all times - Jan Sebastian Bach. TromQuartet?s repertoire includes numerous modern pieces. Many of them were specifically composed for us by both Polish and international artists. Those compositions include pieces by Ewa Fabiańskia-Jelińska, Artur Kroschel, Patrick Friel, Antonio Galanti (among others), and many others. The beautiful sound of the trombone quartet can be further enriched by the addition of organs, the "king instrument". The musical dialogue of the trombone quartet and organs can be witnessed through the interesting compositions by, among others, J. S. Bach, H. Purcell, G. Gabrielle. There are several beautiful interpretations of carols and pastorals in the repertoire, both Polish and international. Those interpretations will put you in a Christmas mood, thanks to their cheerful, as well as solemn, contemplative sounds.